I've never liked to use an external hardware to program microcontrollers, so one of the reasons to choose the LPC1343 microcontroller for the uXbot robot was its internal USB MSC bootloader which enables users to download their firmwares by dragging & dropping files into a flash drive. However, when you're working in your robot, sometimes it's a pain to pick it up and plug it to the PC, specially when you're a lazy engineer 🙂 so here I want to introduce you a tiny Bluetooth Bootloader for the uXbot robot. 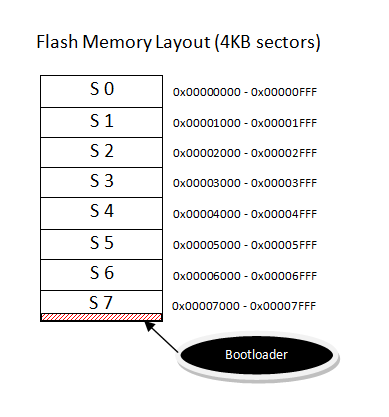 As you can see, the bootloader resides at the end of the flash memory and whenever the user code jumps into it, it copies itself to RAM before starting the flashing process. This way, the bootloader can also be updated from the bootloader itself 🙂 In the video below you can see a demo of the bootloader in action. From the uXbot Manager PC application the firmware is downloaded into the robot's memory (via Bluetooth, of course) and the new code can start running right after the process is completed (less than 2 seconds to download a ~2KB firmware). The user code jumps into the bootloader whenever the button is pressed but the application can enter the bootloader remotely or by any other means.